Attempting to find the right way to make your online interior design related website more eye-catching? Wishing to build a website for interior designer? Or maybe you are establishing a new online portfolio to draw in new clients? Whatever the case is, working out the right look for your Internet project might become quite an exhausting task! We know you could have focused on doing other things instead! Give a go to Moto CMS 3.0 - it is a real time saver for occupied people. 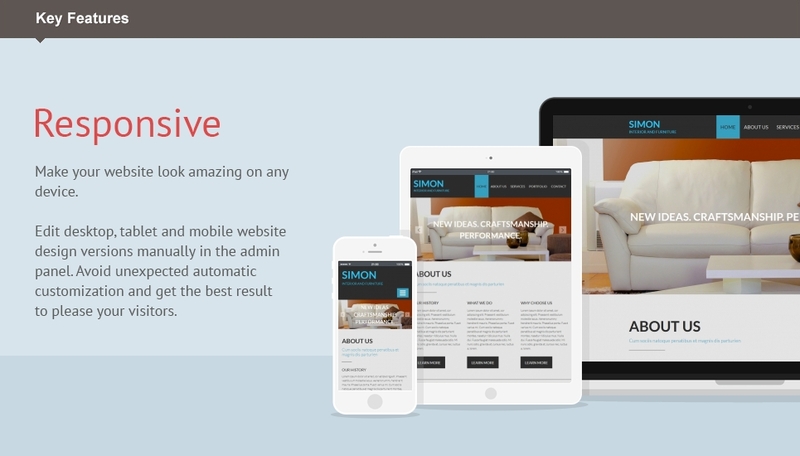 Every Interior & Furniture Responsive Moto CMS 3 Template offers a built-in admin panel. You will not need to download anything from a third-person resource or make any serious adjustments, because you acquire a complete product, ready for use. All the essential ingredients are available in the very same archive: upload everything to your hosting, activate the license and start modifying the contents. Skilled web developers have worked on the style of every single template. Top quality is ascertained! Moto CMS 3.0 admin panel was created on the basis of a WYSiWYG-editor. The elements can simply be edited by pressing on them and you instantly see the result! Once you have bought the selected template, our free 24/7 lifetime technical assistance squad will always guide you when this might be required. Do not wait to address these experts to receive response to all your inquiries! Opt for an Interior & Furniture Responsive Moto CMS 3 Theme to make your company successful immediately! The template is produced specifically for interior design studios, furnishing, flooring companies.